Abang Johari (front, second left), with Fadillah on his right and Awang Tengah on his left, scans a QR code to activate a video at the opening ceremony of the PBB Women and PBB Youth general assembly. Also seen on the row behind them are (from left) Fatimah, Empiang and Gerald. KUCHING: The leadership of Parti Pesaka Bumiputera Bersatu (PBB) must be inclusive so as to realise the broader concerns and interests of all communities. 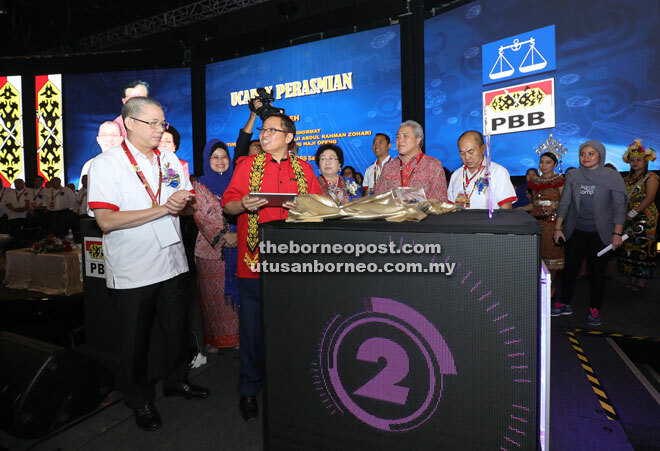 Chief Minister Datuk Patinggi Abang Johari Tun Openg acknowledged that PBB’s strong foundation was established by party leaders, who prioritised the diverse interests of all communities regardless of race and religion. “We have mutual understanding as we move together in the same direction for the sake of our party,” he said in his address at the 14th General Assembly of PBB Women and PBB Youth in Borneo Convention Centre Kuching (BCCK) yesterday. “We feel that the party is more important than ourselves. We feel the party is a platform for us to move forward,” he stressed, noting that selflessness was one of the traits of a strong party. Many people continued to rely on PBB, he pointed out, because the leaders and members had been sincere in serving the people. “That’s why our party is strong, to the extent that there’s no competition for the top leaderships in the Youth and Women sections because they understand this concept (inclusiveness). “That’s the spirit and confidence people have in PBB. This is the quality of leadership that we must safeguard,” he added. Abang Johari, who is also PBB president, commended leaders who had willingly stepped down when their time was due, to pave the way for the younger people to lead. He also emphasised the need for PBB Youth and PBB Women to be equipped with the right knowledge, approach and equipment to move forward. “Time has changed. We need technology and combined with our resources, we can achieve our vision to be an advanced state by 2030 or even earlier than that. “We need new strategies to boost revenues for our state’s coffers, which I know how to but can’t reveal at this stage yet. That’s why I dare to plan for all the big projects like LRT (light rail transit),” he said. Abang Johari reiterated that party leaders needed to be brave enough to lead change and transformation for the betterment of Sarawak and its people. Abang Johari concluded his speech with a quote from Alexander The Great: ‘The greatness of man is not measured by what he is but by what he does’. Prime Minister Datuk Seri Najib Tun Razak is expected to declare open the PBB Convention today. Deputy Chief Ministers Datuk Amar Douglas Uggah Embas and Datuk Amar Awang Tengah Ali Hasan, Works Minister Dato Sri Fadillah Yusof, Minister of Welfare, Community, Well Being, Women, Family and Childhood Development Dato Sri Fatimah Abdullah who is the new PBB Women chief, outgoing PBB Women chief Tan Sri Empiang Jabu and new PBB Youth chief Gerald Rentap Jabu were among the attendees.